The Canary Islands enjoy a remarkably mild climate, in fact, they are located in the Atlantic Ocean, just north of the Tropic of Cancer, a short distance from the coasts of Morocco and Western Sahara, in a stretch of sea where a cool current flows. They are also subject to the trade winds, which blow constantly from the north east. The Canary Islands belong to Spain; there are seven major islands (Tenerife, Fuerteventura, Gran Canaria, Lanzarote, La Palma, La Gomera, and El Hierro) plus some smaller islands and islets. Along the coasts, the daily average temperature ranges from 18 °C (64 °F) in January and February to 24 °C (75 °F) in July, August, and September. The following table, regarding the average temperatures at the airport of Gran Canaria, give us a good indication of all the coasts of the Canary Islands. Owing to the higher frequency of days when the wind blows from Africa, the daytime temperatures in summer are on average slightly higher on the eastern islands (Lanzarote, Fuerteventura), where highs in the July-September period are around 28/29 °C (82/84 °F), and slightly lower on the western islands (El Hierro, La Palma), where they remain around 26/27 °C (79/81 °F). Fluctuations are small: in winter, the temperature in the lowlands almost never drops below 10 °C (50 °F). On the other hand, the peaks of summer heat are about 33/34 °C (91/93 °F) in El Hierro, the westernmost and most sheltered island, 37/38 °C (99/100 °F) in La Palma, and 40 °C (104 °F) and more on the other islands: these values can be reached in the short periods when a hot and dry wind blows from the Sahara desert (which, in recent years, have become more frequent). In these situations of intense heat (called Calima), which are usually more frequent in July and August, on the easternmost islands, the air can be filled with dust and sand, while on the western islands, an unusual (for these islands) and annoying calm dominates. These periods are not recommended for trekking and hiking because in the areas located at an altitude higher than sea level (called medianías) the African heat is even more intense than on the coast. Apart from some rare rainy and windy periods in late autumn and winter, those of Calima are the only unpleasant moments of this climate, which for the rest is almost always enjoyable. Although they have, in general, an excellent climate, the Canary Islands are not all equal. On the islands that have mountains in the interior, such as Tenerife and El Hierro, you can find microclimates depending on slope exposure and altitude. In fact, the northern slopes (above which the trade winds are forced to rise, and by doing that, they cool down and condense into clouds, rain or mists which can also cause drizzle) are more cool and cloudy, while the southern slopes, being on the leeward side, are more dry and sunny. For example, in San Cristobal de La Laguna (aka Tenerife North), 600 meters (2,000 feet) above sea level, the average temperature ranges from 13 °C (55 °F) in January (and in unheated houses it's cold...) to 21 °C (70 °F) in August, so it's definitely cooler than in Santa Cruz, the largest city of Tenerife. At 2,400 meters (7,900 ft), at the Teide observatory of Izaña, the daily average ranges from 4.5 °C (39.5 °F) in January (with night temperatures around freezing) to 18.5 °C (65 °F) in July. Teide volcano, however, the highest peak of Spain and of all the Atlantic Ocean, is 3,700 meters (12,100 ft) high; during winter, the top is covered with snow. Other volcanoes, though lower, are found on the islands of La Palma and Gran Canaria. The eastern islands of Lanzarote and Fuerteventura, which have only hills in the interior and are windswept, are a paradise for surfers, while they are not particularly appreciated by those who seek, in addition to the sea and beaches, cities and interesting places to visit. The north-east trade winds, typical of subtropical climates, are the prevailing winds, but they follow a diurnal pattern similar to that of the sea breeze, so they are most intense during the warmest hours and in the afternoon, and often blow at around 50 kph (30 mph). The cool and breezy weather conditions can make it pleasant to sunbathe and to do other outdoor activities, but it must be remembered that the tropical sun's rays (as mentioned, we are just north of the Tropic of Cancer) are very strong, so there's the risk of sunburn without appropriate precautions. The sun is strongest from late May to late July. The rainfall pattern on the Canary Islands is typically Mediterranean, with a maximum in winter (but also in November in many areas) and a minimum in summer, with virtually no rain in the warmest months. However, both the amount and frequency of rainfall greatly vary depending on slope exposure, as well as on altitude. Therefore, there are semi-desert areas, usually, the slopes facing south and west and almost all the lowlands and the coasts, where the average rainfall does not exceed 250 millimeters (10 inches) per year and the landscape is arid, and areas with moderate rainfall, similar to that of many Mediterranean islands, which are typically the east and north facing slopes, especially at an altitude between 1,000 and 1,800 meters (3,300 and 5,900 ft). Here is the average precipitation in Las Palmas de Gran Canaria, on the coast: as you can see, the rains are very scarce. 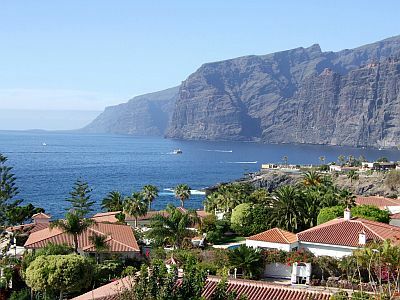 In the Canaries, the amount of sunshine is very good throughout the year, however, in addition to the low pressure systems that can affect the islands in the October-March period, in summer, cloud banks can form on the Atlantic and reach the islands. On the northern coasts, and especially on the mountain slopes exposed to the north, local clouds and fogs can form. The southern coasts are therefore the sunniest ones. Here, for example, are the average daily sunshine hours at the Tenerife South Airport (Tenerife Sur). Owing to the same cold current that makes the climate so mild, the sea in the Canary Islands is not warm. On the central islands (Tenerife, Gran Canaria), the water temperature ranges from 19 °C (66 °F) between winter and early spring to 23 °C (73 °F) between August and October, which therefore is the best period for swimming. However, with a little courage, you can try to swim even in winter. On the western islands (La Palma, El Hierro), even though the Saharan wind blows more rarely, the sea is slightly warmer because the cold current flows near the coast of Morocco, ie in the east. For the same reason, on the easternmost islands (Lanzarote and Fuerteventura), the sea is slightly cooler (about one degree Celsius less than in Tenerife). Here are the average sea temperatures in Tenerife. You can visit the Canary Islands throughout the year, since they have a very mild climate. However, in late autumn and in winter, temperatures are spring-like, and some cloudy days can occur, as well as a bit of wind and rain. While northern European tourists often arrive this time of year to escape the Nordic winter, and they find many sunny and pleasant days, the period from May to mid-October will be preferable for a beach holiday, although the sea is still cool in May, and will warm up gradually in the following months. In winter: bring light clothes for the day, a sweater and a jacket for the evening, and possibly a raincoat or umbrella. To climb mountains, and in particular Mount Teide, a down jacket, a hat, gloves, hiking shoes. In summer: bring summer clothes, but also a light sweatshirt, a light jacket for the evening and for windy afternoons; comfortable shoes for hiking. For Lanzarote and Fuerteventura, a light scarf for the wind and the wind-borne desert sand and dust. To climb mountains, and in particular Mount Teide, hiking shoes, a sweatshirt and a jacket for the highest elevations.